The James Slater Papers are ripe for any interested researcher, whether the topic is scientific, entomological, or historical. Here we have a fascinating man’s life, observations, and accomplishments awaiting study and reference. James Slater was a remarkable person, and his papers, dating from the early 1930’s to 2004, prove it. Slater’s chosen career at UConn was as a professor of entomology, but entomological study was not enough for him. There was another field that also caught his interest—the study of gravestones of the American Colonial period, and their carvers. He visited even the most neglected graveyards in Connecticut, carefully recording his discoveries of particular carvers, and published a book on the subject. The sheer amount of writing required for his scientific and historical work would be more than enough for most people, but not for Slater. Even while he was carefully recording data and writing on bugs and gravestone carvers, he recorded the daily events of his own life in a long-running daily diary. A look at all these things in the James Slater Papers offers us a glimpse of his scientific career, his historical avocation, and his inner thoughts. The scientific, professional part of Slater’s life is the most prominent in the collection, with scientific subjects occupying much of the correspondence. It is here that Slater’s career is laid out in detail, and we can see how devoted and interested he was in his field. He frequently corresponded with other entomologists as far away as Russia, Germany, Australia, and South Africa, often assisting others in the study of true bugs (hemiptera) of the family lygaeidae, while gathering his own research through field work and specimen collections. 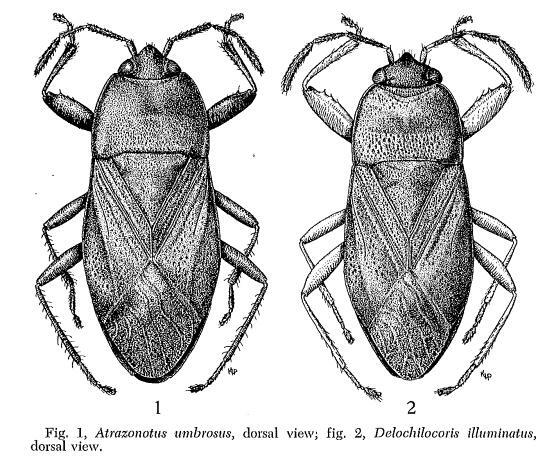 We can see the product of this research in the large number of printed publications, detailing the discovery of new species of bugs, including Atrazonotus umbrosus, pictured here. Slater’s gravestone research and personal diaries are somewhat secondary in number to the extensive amount of entomological research, but they do not dwindle in importance or interest, and are far from sparse. The diary is composed of 61 volumes of its own, while the gravestone research is monumental enough to be distributed across several boxes. As a result of his long research into gravestones, Slater wrote a detailed book, The Colonial Gravestones of Eastern Connecticut and the Men Who Made Them. Several iterations of the manuscript of this book, along with Slater’s detailed notes and correspondence on gravestones, can be found in the collection. The manuscripts and galley proofs provide photographs of all the stones that Slater describes. The large number of carefully organized drafts and research notes illustrate the careful, accurate research that Slater put into this project in his meticulous analysis of the work of early American carvers such as Jotham Warren, Obadiah Wheeler, and many others. James Slater approached this avocation with a professional interest, working with as much care as he devoted to the study of the bugs of his professional career. The same can be said for his diary. The 61 volumes present an almost uninterrupted account of his daily inner thoughts and observations from the years 1937 to 2004. 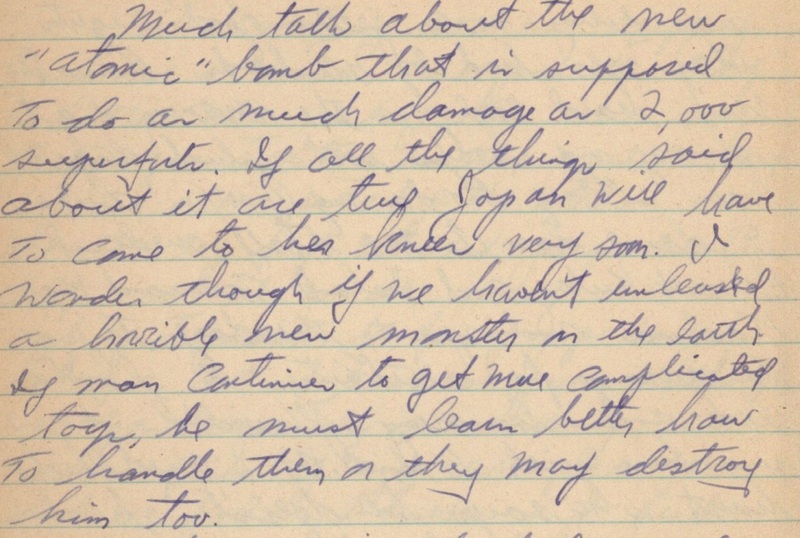 It is here we can learn about his life in the days before his entomological career, and before his study of gravestones, of his time in the Navy in World War II, his thoughts on the war itself, its beginning in Europe and then the United States, and his horror at the news of the atomic bomb, pictured here in his entry for August 8, 1945. The sheer extent of the time covered by the diaries provides us with both these descriptions of important historical events, while also illustrating the progress of this one remarkable, multifaceted, prolific man, from youth into old age. Through its extensive amount of documents, and such a wide range of topics, such a collection as this cannot be consigned to obscurity, but will surely remain an important resource to researchers from many different disciplines for many years to come. Fascinating article on someone I’ve never heard of before. Makes me want to read about his grave stone information, in particular, and visit some old graveyards, myself. Thank you. When I teach the End of Life course (NURS 1175W), I use Slater’s very fine book as background material for a lecture (“Death on the Landscape”) and a tour that I conduct of the Storrs Congregational Church burying ground. In the book and video series American Visions, the late Robert Hughes claims furniture as the first Euro-American art form in colonial North America, but I’m inclinded to view gravestone carving as having an even greater claim to this distinction. Thanks, Daniel, for this overview of the Slater collection.